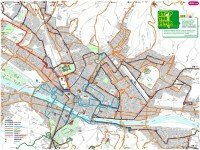 The bus network in Florence, Italy, is run by ATAF. Timetables and other service information about day busses, night busses, electric buses and trams can be found on their website, much of which is in English. For the ATAF maps page, click the thumbnail map below. Click and then select the map you want. More information and timetables from ATAF here. Florence airport (Amerigo Vespucci) is just 4 km north-west of the city centre, a short 20-minute ride on the bus shuttle from the airport to the central train station, Santa Maria Novella. Departures from the airport are every 30 min from 5.30 a.m. and then every hour from 8.30 p.m. Hours are the same on weekends and holidays. One-way tickets can be bought on the bus from the driver, but if you want a round trip ticket, you’ll need t buy it before getting on. If your accommodation in Florence isn’t near the station, consider this shared airport transfer service in an 8-seater minibus direct to your hotel or apartment. The cost isn’t much more and it’s well reviewed.